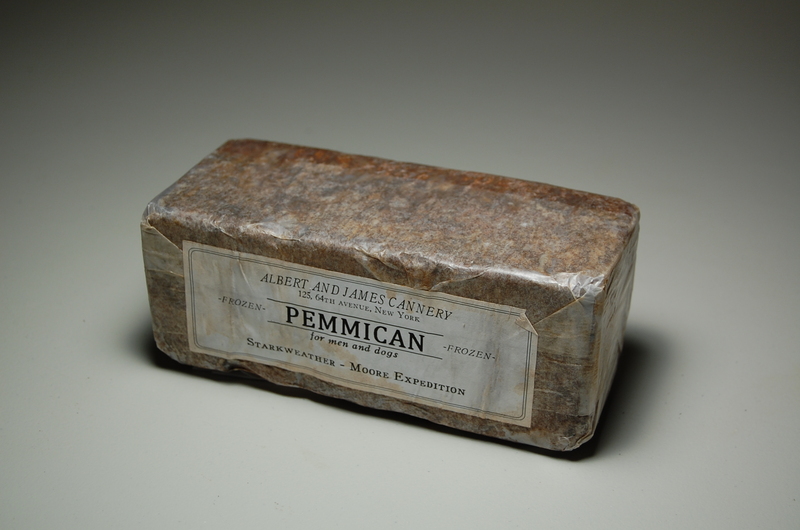 Pemmican is the staple protein food for both men and animals in the Antarctic. 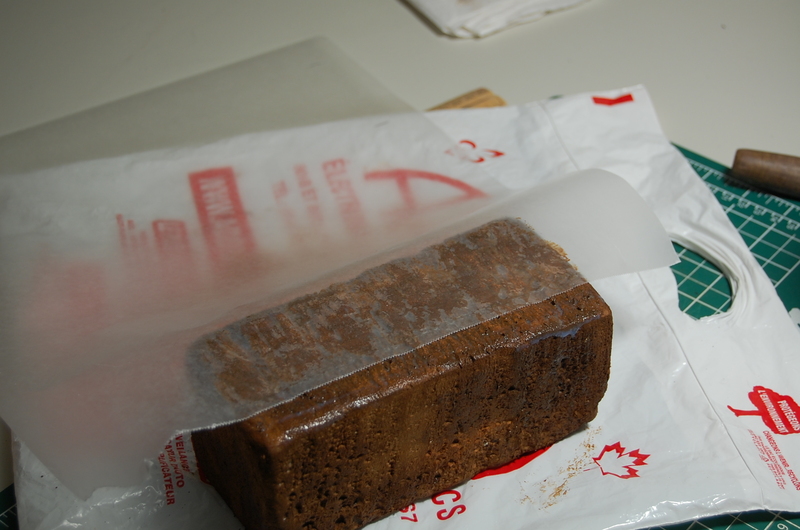 It is made from a mixture of beef tallow, dried ground meat, wheat germs, molasses and cod liver oil. To every one thousands of this mixture are added two pints of lemon squeezings. 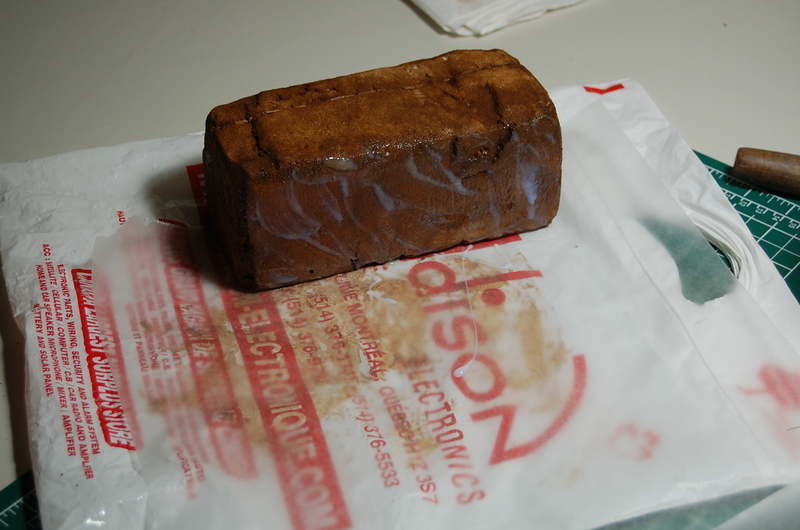 This mixture is then shaped into compressed one pound blocks, wrapped in waxed paper or tinfoil, and frozen solid. 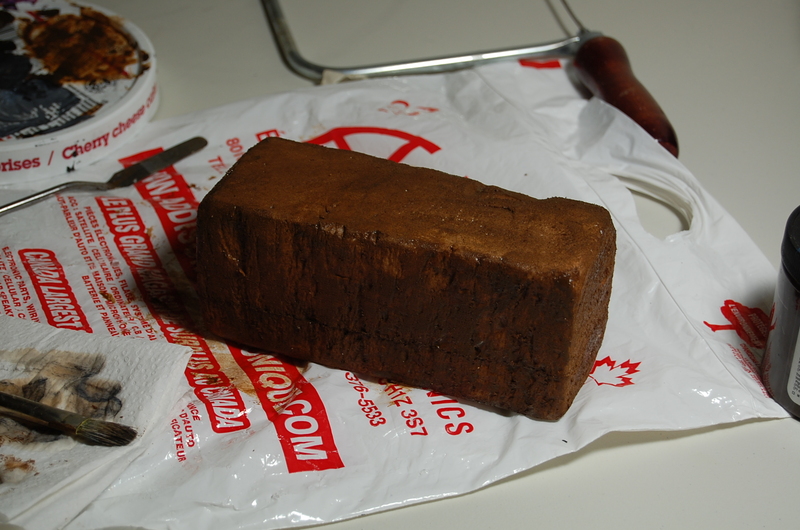 The block are fed to dogs without preparation. 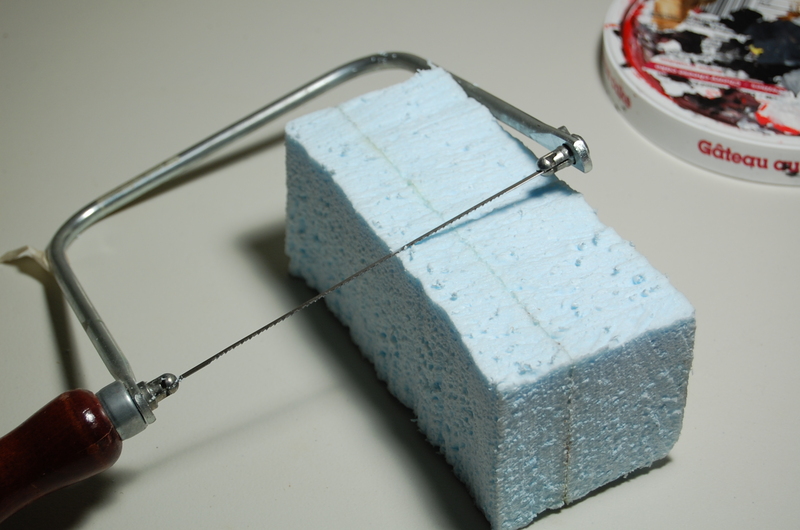 for expedition members, the blocks are dropped into stew pots as the quickest way to cook them. 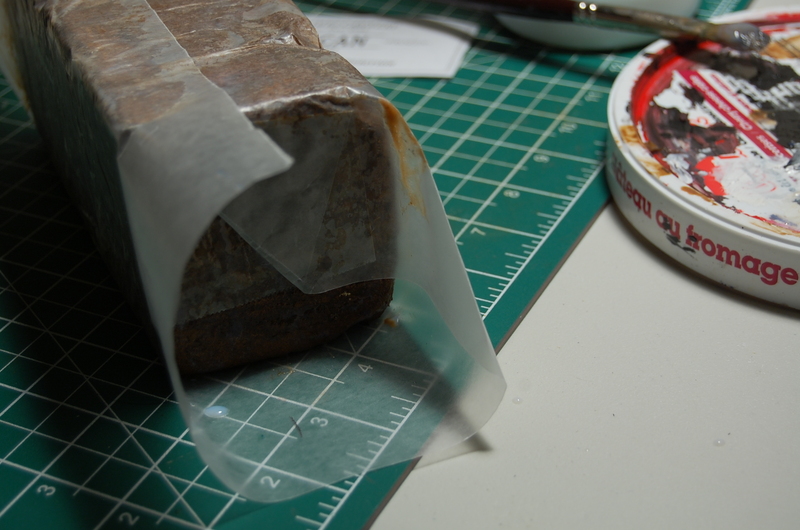 As promised, after having put the pemmican label for download here, I did a little tutorial with photos to show how you can turn these labels, some styrofoam and a bit of time into a realistic prop that will certainly add to the ambiance of your next arctic related call of cthulhu game. 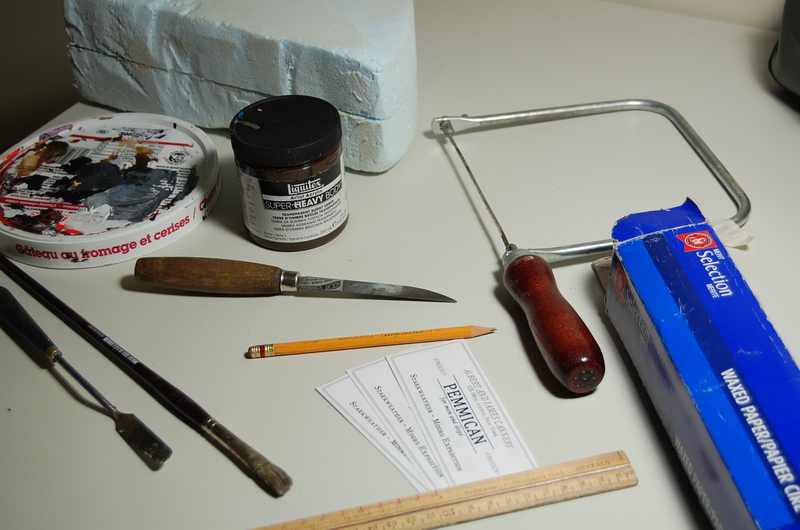 Once you’ve gathered all these things, you can start building you pemmican block. 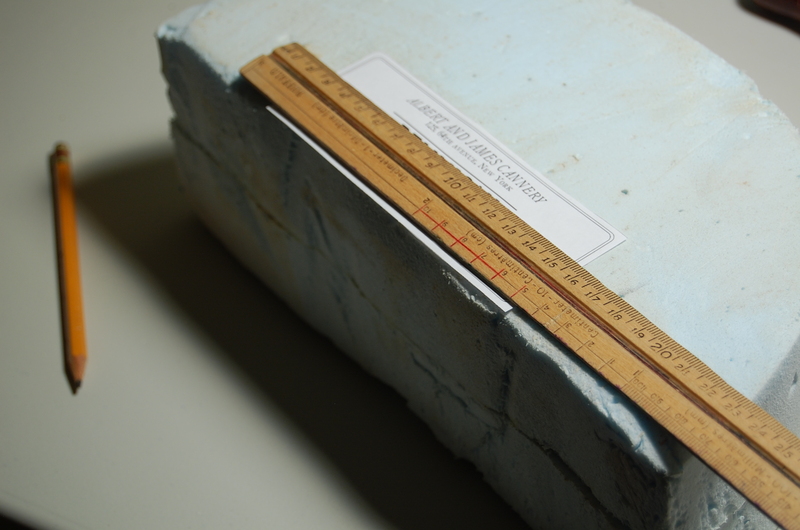 Step one : take your prepared block of styrofoam and mark the dimensions of you future block on it, reffering to the label, I put approximately 1 inch more each side of the label, the height and width of the block should be around 3″. 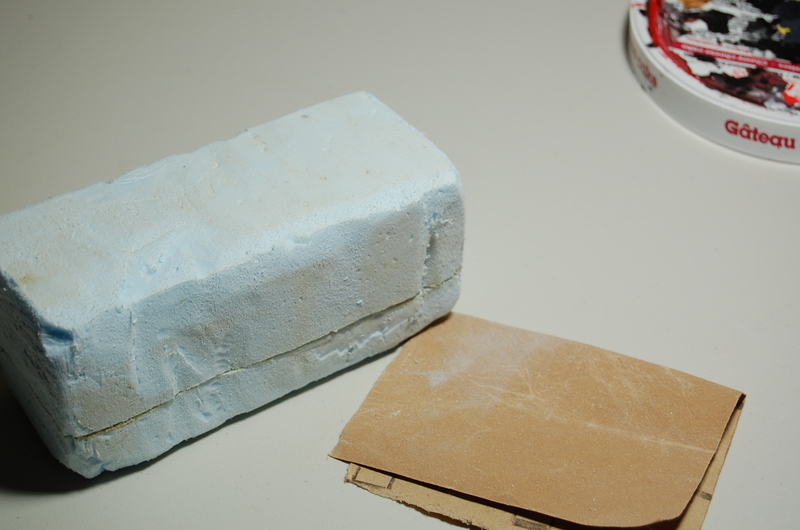 Step three : Take you freshly cut piece of foam and some sandpaper (100 grit or coarser is fine) and sand down the corners and the sides of your block to make it look more like it was shaped by hand. 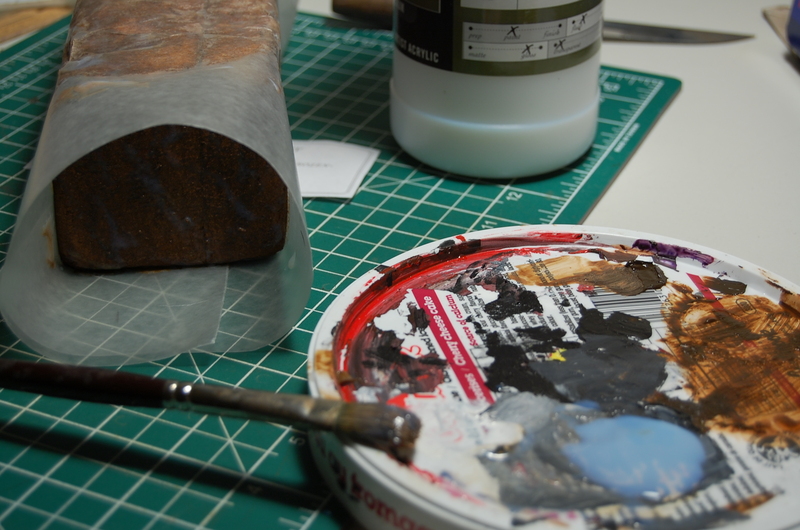 Step four : remove all dust form the sanding and prepare your acrylic paint by mixing it with a little bit of water to make it more fluid. 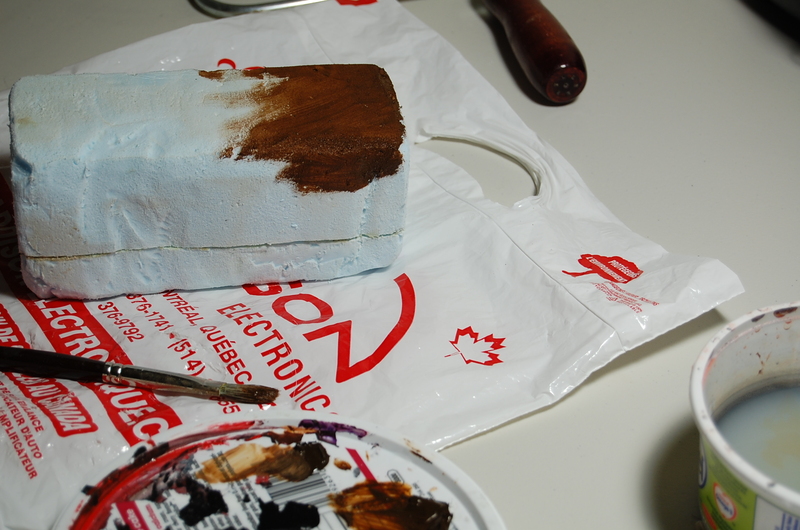 Paint the entire block takign care to vary the intensity of the brown over the whole surface, let it dry. 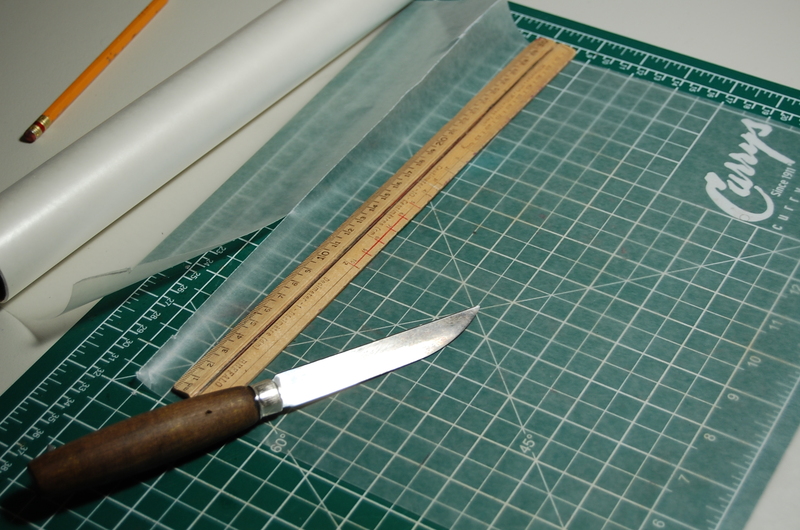 step five : While the paint is drying take a cutting board and the waxed paper roll and cut a section 13″ long (3″ for the four sizes plus an extra of 4″) and set it aside with the rest. 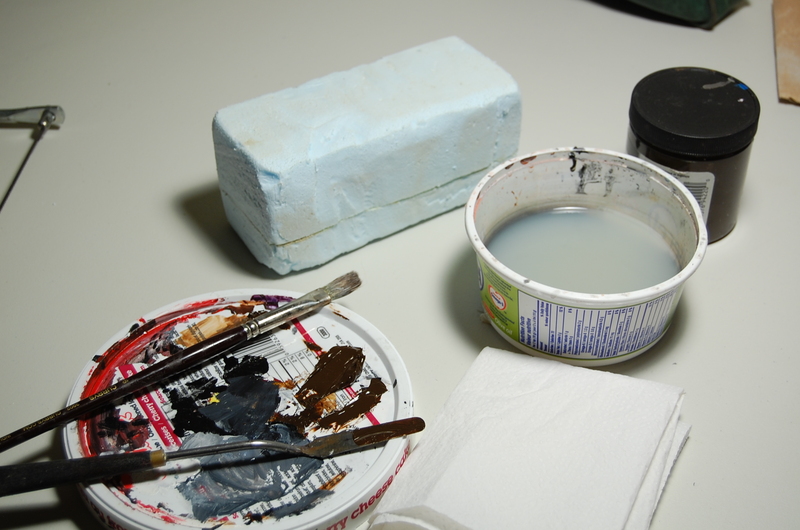 Step six : Now that the paint on your block has dried, take the acrylic medium and paint some of it on one of the sides of the block, stick the waxed paper to the side, taking care to keep the extra parts of paper on the two sides equal, also let a 1″ distance from the side of the block. 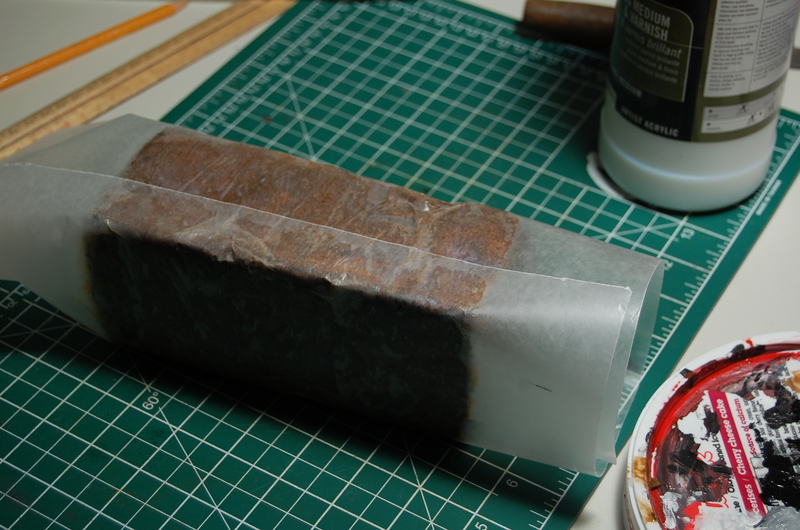 Turn your block so the waxed paper in lying on your table and paint the next side with acrylic medium. 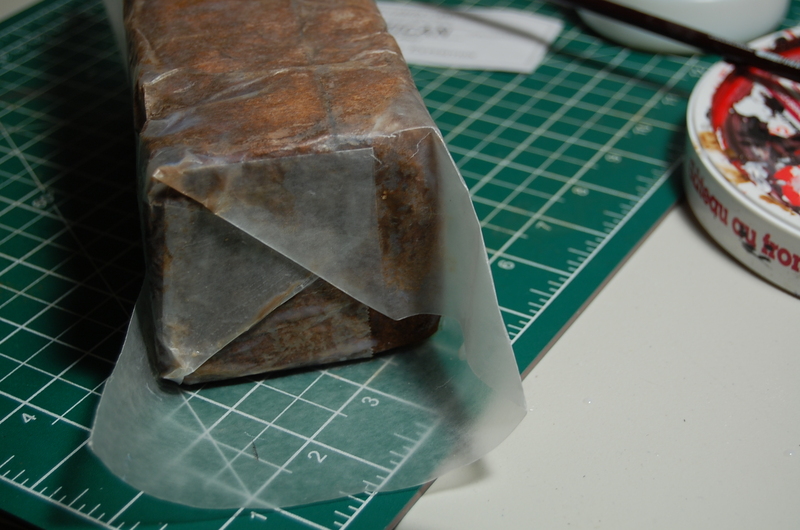 Stick the paper to it and continue like that for all the sides of the block until it is entirely wrapped like in the picture. 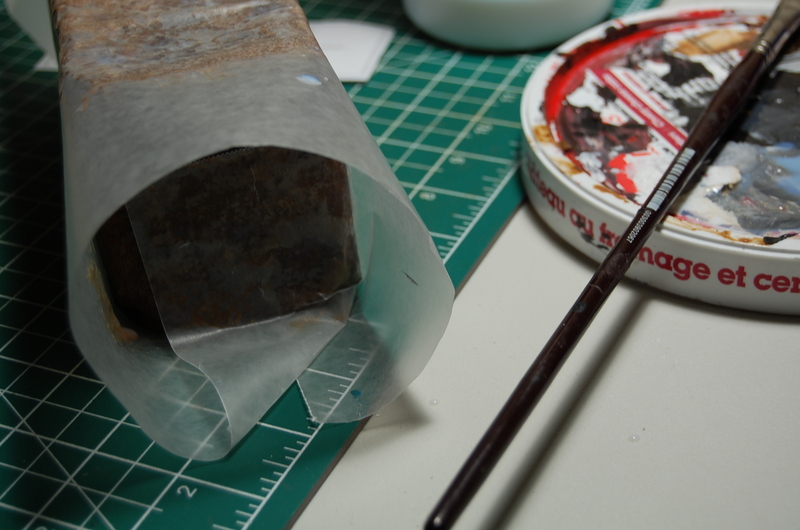 Step seven : Paint the sides of your block with acrylic medium and fold the first section of paper so a part of it stick to the block and the rest forms a triangle shape, apply more medium and stick that triangle to the block forming a new triangle. 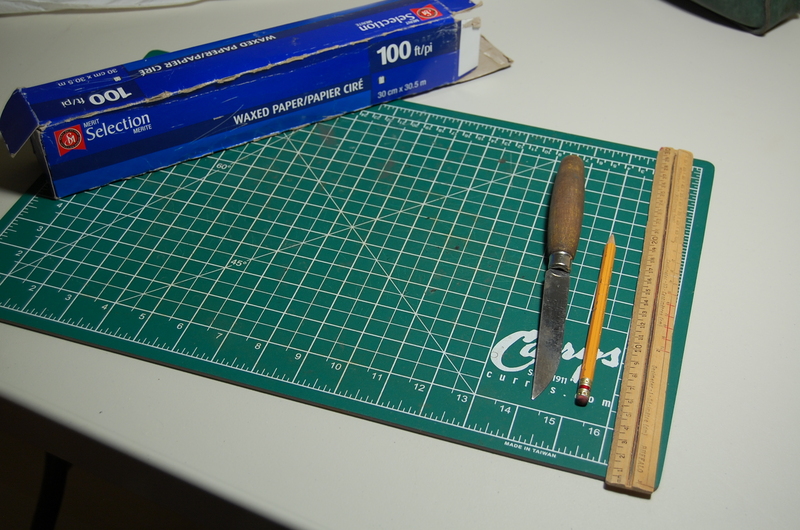 repeat until a little piece of paper is left and stick this piece to the other side of the block with acrylic medium, repeat for the other side. 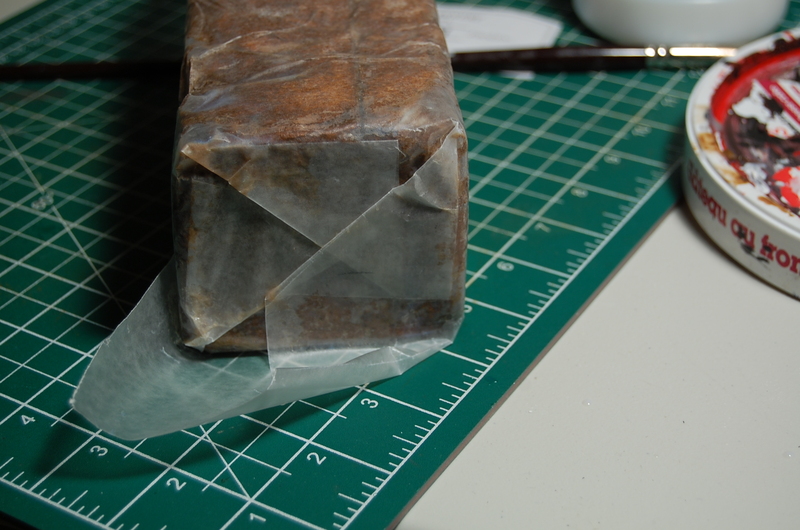 apply some more acrylic medium on the folds of the sides to make them more sturdy, let the medium dry. 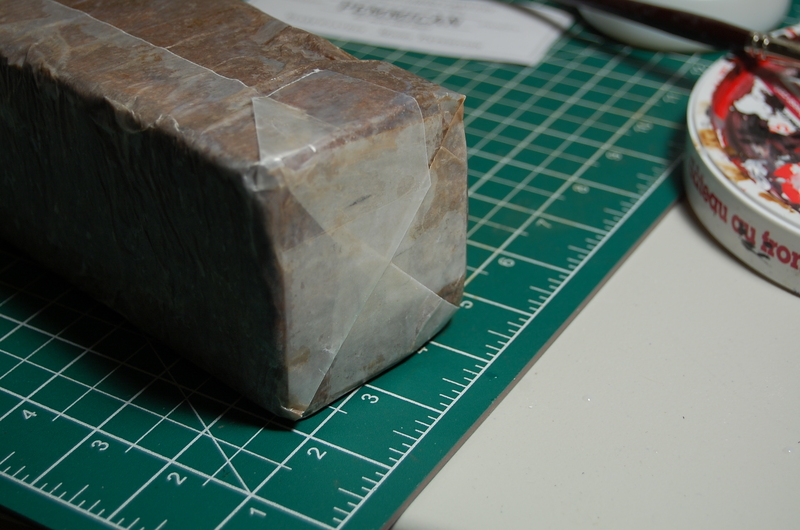 Step eight : Cut one of the pemmican labels and stick it to the side of the block with apparent folds so it holds the entire wrapping, set aside to dry. 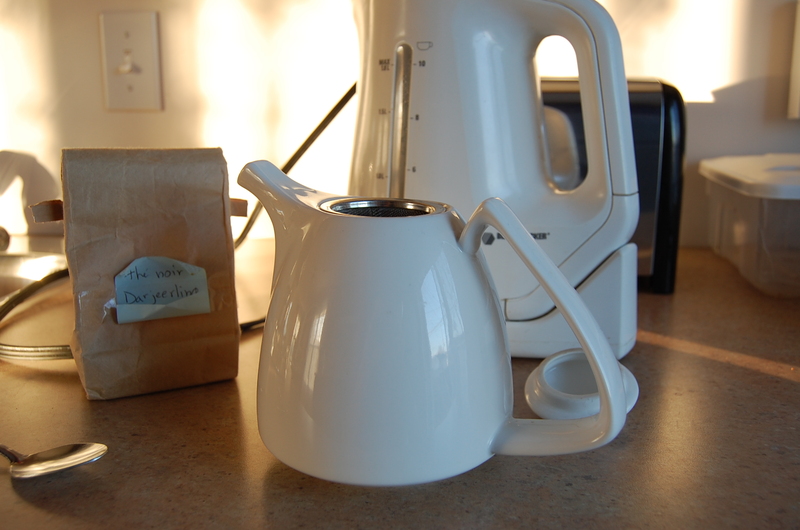 Step nine : go to your kitchen and find some dark black tea and prepare a tass, go back to your now dry block and with a brush apply tea uniformely to the label, wait until it dries and repapply some on the sides if the label, make some drips and scrape the corners of the label to simulate the light damaging occasioned by the handling and shipping of the pemmican block, for this step you can also refer to my article on paper aging here. Step ten : admire your realisation and use for whatever use you found for it : ambiance enhancer for a game, decoration element for your room, book holder, amateur lovecraftian movie prop, etc. 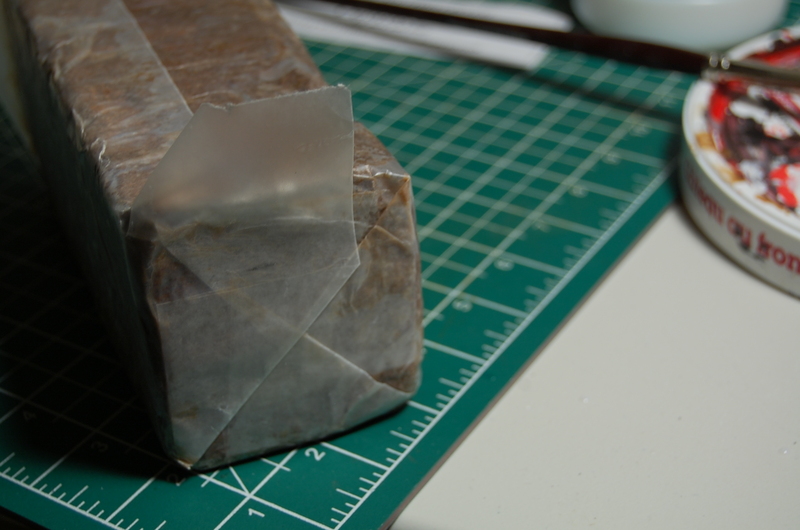 I hope you enjoyed reading through this tutorial and maybe realising one of these pemmican block props. i know that I’m not posting a lot of material which is prop related these times but I might come back to it soon. This entry was posted in lovecraftian, props, tutorials and tagged call of cthulhu, cthulhu lives, lovecraftian, mountains of madness, pemmican, tutorials. Bookmark the permalink. Oh, delightful! 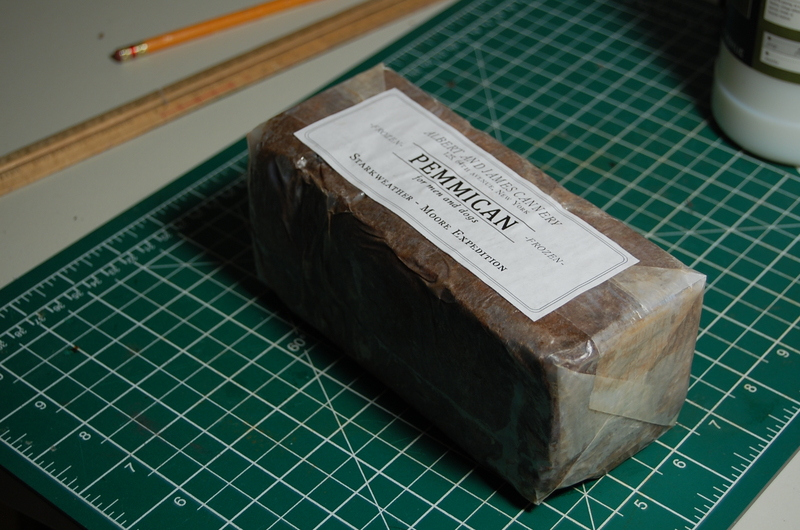 I briefly considered making some actual pemmican for us to eat in the game, but I never got around to it. Maybe next time! 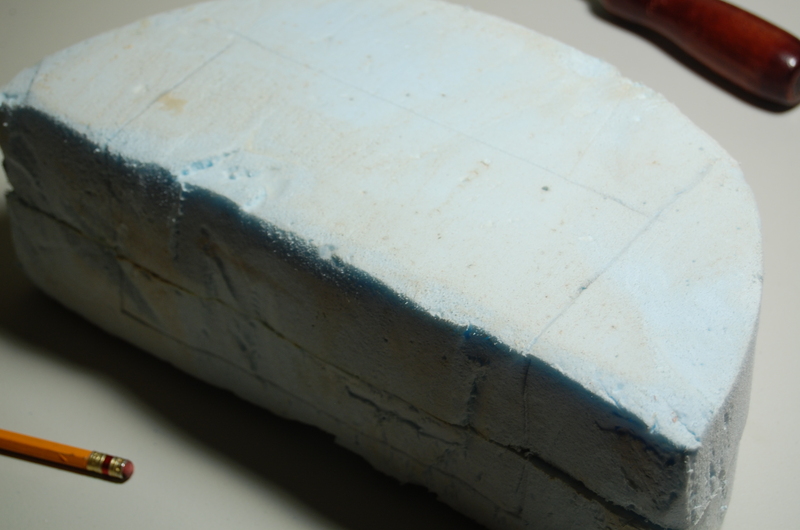 I thinked about it too…but finally got to make these fake blocks in the place. 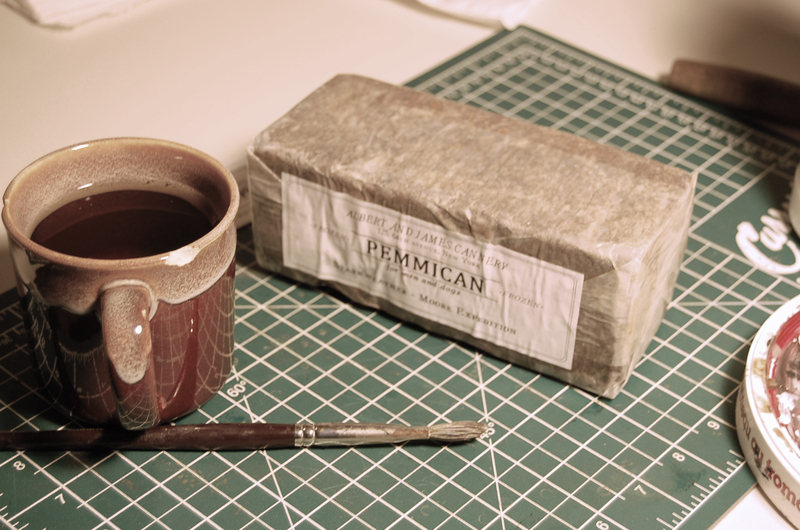 And I think I’ll do the PAMMICAN label, it will be a nice little touch. Nice to see other people appreciating this scenario.